…and other thoughts from when I was abroad…. I’m just back from a happy week in western Brittany with my family. 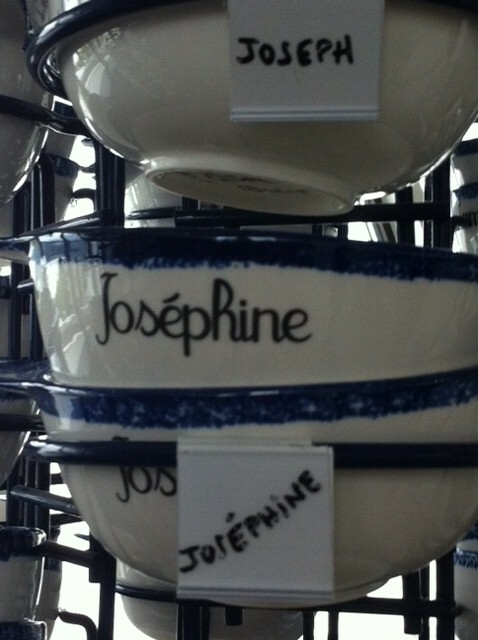 I really enjoy seeing my name emblazoned on mugs, bowls, key rings and other such items when I’m in France, the extra accent on the first ‘e’ is the icing on le gâteau, and, frankly, I don’t miss the “Not tonight” jokes one bit. And while I don’t mind people shortening my name to Jo or Josy, it is fun to be in a country where a name of three syllables phases nobody. Talking of syllables and language, I was taken aback in la pharmacie on Friday (buying a homoeopathic seasickness remedy for my daughter) when a British couple in the queue (rather a long queue – not that I believe any of the stereotypes about French people being hypochondriacs or anything) could only say “English, English, English”, over and over, when a shop assistant was trying to find out what they wanted so she could direct them to a slightly less busy section of the shop. I don’t know what their situation was but I was embarrassed by their inability to say, or attempt to say, one phrase in French (even if they’d just said “anglais, anglais” repeatedly it would have seemed less rude). I hope this doesn’t happen too often. I know that English people, in particular, have a reputation for being reluctant to speak other languages but I had thought that this was becoming a thing of the past and that we were now making more of an effort to speak a few phrases of another language when we ventured away from our British shores. In my time I’ve been laughed at for mixing up la gare (railway station) with la guerre (the war) and during this holiday I confided to a rather handsome barman that “I was not a pair of glasses” (rather than telling him that I didn’t have my glasses with me so couldn’t find the small change that he was asking for). I make enough errors in English, every day, so I’m bound to make plenty of mistakes when I try to speak other languages but I don’t mind having a go. Anyway, I thought I’d write a poem about it. I don’t often post my own poems on here but perhaps the sunshine and vin rouge have gone to my head. It’s not quite right yet – I might change it completely – but here’s a first draft. All comments welcomed. lie blurred and glittered on my upturned palm. “I am not my pair of glasses,” I confide. A shortlist, a tumblr and let’s accidentally connect! I really like this clever and funny poem Josephine. It might be an idea to end it after ‘English, English’, as I think this might say everything and perhaps more than the final two lines as they stand. It could also allow you to make two equal stanza’s which might give the poem more balance. Merci for your comment, Jim! Wonderful! My own command of French seems to have slipped since those heady days of drooling over my GCE teacher. However, it may be better than I think. At a lace convention in Normandy(I’m married to une dentelleuse) I saw a hand-written note titled ‘L’Histoire d’Os’ on a stand selling bone bobbins. I thought this a wonderful pun on the racy novel and shared it with my friend Jan, who said “That doesn’t work: bone is pronounced ‘oss'”. Confiding to my multilingual (librarian) sister that my friend didn’t get the difference between ‘a’ bone, and bone generally, my sister replied “I don’t get the pun” and I had to explain to her about the novel. Awkward.